Corison winery was designed by Cathy's husband, William Martin. Cathy Corison is definitely doing her own thing. Diminutive and wearing blue wire-framed glasses, Corison has worked 41 commercial vintages in Napa, "and one vintage as intern," she adds. It's safe to say her experience allows her to chart her own course. "When I got here there were 30 wineries," she says. "30." 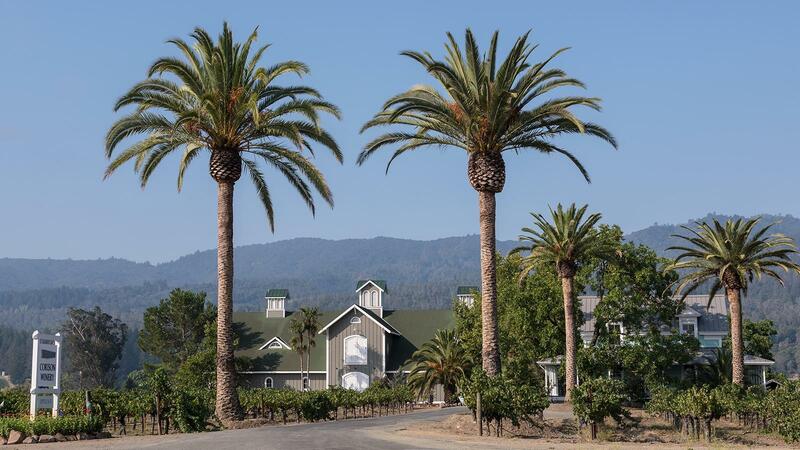 There are a lot more than 30 now—the Napa Valley Vintners trade group reports about 475 wineries in Napa and more than 1,000 wine brands—and many of Corison's colleagues and neighbors have flashier production facilities and take a decidedly different approach to winemaking. But Corison's winery and vineyard sit right in the middle of St. Helena, even if her tasting-room hours are short and the simple barnlike structure still doesn't have its ceiling insulation covered. We step out the backdoor into her Kronos Vineyard, planted in 1971 and purchased by Corison in 1995. "St. George," she says of the rootstock her Cabernet Sauvignon vines are grafted to, a smile breaking over her face. Napa's darling rootstock back then was AxR1, which proved disastrous when phylloxera struck in the 1980s; most of the Cabernet vines in Kronos Vineyard are more than 45 years old. "When I got [to Napa, in 1975], there were two things people did: pruning and picking. That was it," she says. "There was no crop thinning or canopy management or any of those things. So in good years vineyards made good wines and in down years not so much. The swings were wilder, in part because of the higher yields. We've gotten so much better in the vineyards over that time." Today her Cabernet Sauvignon vines are seemingly riddled with leaf roll virus—the telltale red-leafed canopies dot the vineyard everywhere. The virus reduces yields and hinders ripening, a symptom that Corison uses to her advantage. "When St. Helena gets hot—and it is the hottest spot in the valley—a lot of other vineyards shut down. But these big guys just keep trucking along, nice and steady," she says. "They ripen, just at lower sugars." Counter to prevailing Napa Cab conventions, Cathy Corison favors old vines. Corison's wines typically check in under 14 percent alcohol, low compared to most Napa Cabernets. The style is bright, high-toned and fresh, with a crunchier feel rather than plush or dense. And they age remarkably well—I recently sprung for a bottle of Corison's 1996 in a restaurant and it was a wine that was fully mature, confidently so, and in no hurry to finish its run, either. "That is what we want to do, to make wines that age for 30 years," she says. "It's what I wanted to do when I got to Napa. And now that my first few vintages have hit age 30, I can say confidently that I achieved that." After working at Chappellet in the 1980s, Corison made the wines at or consulted with Robert Sinskey, Rombauer, Etude, Staglin, Long Meadow Ranch and others along the way while starting her own label in 1987 (she no longer consults). She makes a mere 3,000 cases of wine a year. As we walk the vineyard, Corison laments the trend among Napa vintners to replant vines once they hit about 20 years in age, favoring higher-yielding young vines. "I can't stand it," she says. "A vineyard is just getting mature at 20 years. It doesn't make sense." As we discuss her notably fresher and lighter-bodied wine style, Corison doesn't get on a soapbox or quote a dogmatic approach. She calmly echoes a common refrain: "The main question is what is the best thing to do with a given place. I'm looking for energy, vibration. And what drew me here was the dirt. I knew this dirt could produce long-lived wines." The first Kronos bottling was the 1996, and the vineyard yields about 400 cases annually. Corison bought the nearby Sunbasket Vineyard, planted by André Tchelistcheff in the 1950s and from which she had been purchasing fruit for decades, in 2015. "I'm not picking to hit a certain alcohol number," says Corison. "Cabernet produces so many flavors. From red and blue fruits, to cassis and black fruits. The beauty for me is to have them all in the same glass at once. If I wait too long, I lose the red and blue fruit. If I pick too soon, I won't get the black. The idea is to pinpoint the pick date so we get them all together." Winemaking here is minimalistic, with no sulfur dioxide added at crush, "a risk, I know," she says, and just a bit of commercial yeast added to the native population to ensure the fermentations finish. "I like to start the ferments hot right away, and then cool them down progressively as the alcohol rises, as that is a strong extractor. The good tannins and good flavors come out early in the ferment, the more bitter elements later." From there the wines are barreled down for malo, after which Corison makes her first sulphur addition. To demonstrate the wine's ageability, Corison opened a bottle of her 2001. It's elegant yet persistent—no bombast. Instead it relies on precision and balance, allowing it to reach maturity and then easily hold steady. Just like the winemaker. WineSpectator.com members: Get James Molesworth’s tasting notes for Corison's 2001 Napa Cabernet, as well as more recent bottlings.